Water resources are subject to competing uses, mostly drinking water, agriculture and energy production. While water resources are becoming increasingly scarce in some regions, implementation of the human right to water has to be secured. This combination calls for innovative approaches and the joint efforts of the public and private sectors. 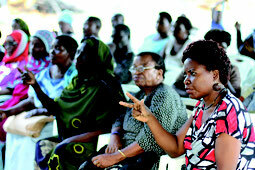 Some members of the public view any kind of involvement of the private sector critically. An often cited example for a dispute over the privatization of the water sector is the so-called “Cochabamba Water War” in Bolivia, which took place in 2000. However, human rights neither prescribe any specific type of service delivery model nor that the provision of water and sanitation services must be free of charge. What human rights do demand is that pricing policies are designed to ensure that everyone can afford to cover the basic needs without having to forgo other basic needs. Accordingly, sufficient water for basic human needs may need to be supplied free of charge. At the same time, human rights must also be protected from abuse by private sector actors. 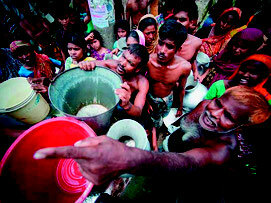 With growing water scarcity, government intervention and close monitoring becomes paramount. In this context, it may also be necessary to redistribute the water, especially between industrial and agricultural sectors and private households. Applying the principles of “Integrated Water Resources Management” (IWRM) and environmental flows can help in achieving this. States are obliged to respect, protect and guarantee the human rights to water and sanitation. Respect means that the state itself must not interfere with the enjoyment of human rights in any direct or indirect way. The duty to protect human rights means that the state must prevent third parties from interfering with the enjoyment of rights, for instance, through the enforcement of regulations to prevent companies from harming human rights. The obligation to guarantee human rights is met by taking all means necessary to fully implement them. However, it is apparent that it will not be possible to implement them immediately and worldwide; particularly the least developed countries often need international support. In case these obligations are violated by a state, every individual has the right to seek remedy, including in a court of law. Successful legal actions have already been taken among others in South Africa, India, Nepal, Argentina, Columbia and France. Legal frameworks are not only required to safeguard the human rights to water and sanitation but also to harmonize various economic and also ecological demands, such as drinking water supply, hydropower, shipping, energy production and agriculture. Within the European Union, the Water Framework Directive adopted in 2000 is an example for such a holistic approach. In many places around the world, local customary water and sanitation rights are more important than formal legislation. In such cases, effective water management requires sound tenure arrangements, which means a sensible balance of formal and informal rights and regulations. Water tenure is a social concept that defines the various formal and informal relationships between people, as individuals or a group, and a resource such as water. Past experiences with the concept of tenure in connection with land have been positive. The UN Food and Agricultural Organisation (FAO) increasingly supports similar approaches in relation to water resources. The concept of water tenure reveals the reality of water use demands and property status, thereby facilitating holistic solutions outside the political sphere, tailored to the specific circumstances. In times of growing water scarcity, such pragmatic approaches are essential. In addition, regulations in the water sector should follow the general guidelines of good governance: participation, transparency, accountability, legitimacy, equality and fairness, efficiency and effectiveness, as well as rule of law.